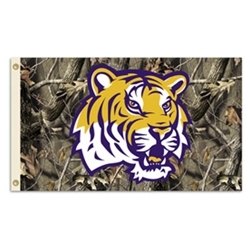 Show your Tigers support with a Louisiana State Tigers Camo 3x5 Flag. This Louisiana State Tigers flag is made of heavy duty 150 denier polyester and is the perfect size to fly from your home or event. Our 3x5 tigers flag has a reinforced white header containing two grommets for flying. Go ahead and shout your team pride by ordering today!